Jour de Fête (1949) – Movie Review – Another Movie Blog! 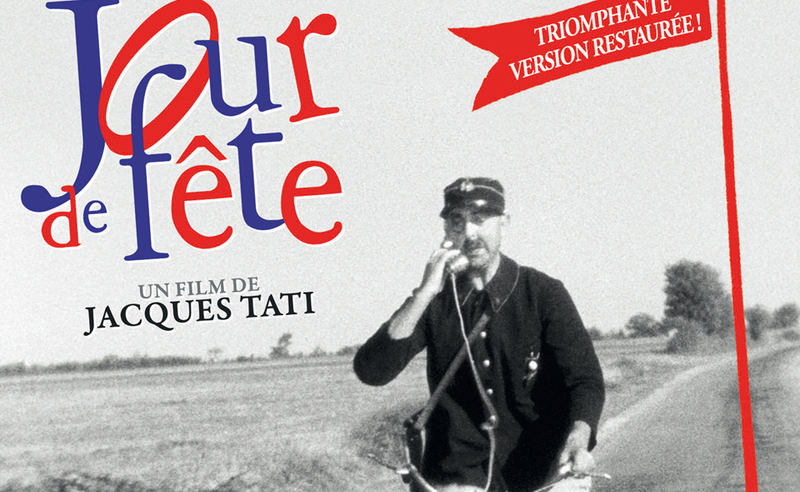 Jacques Tati’s first feature length film, Jour de Fete is actually a conglomerate of many of his previous shorts under a nameless character (who here is called François). In many ways this shows; Tati was never grand on plot, but except for maybe Monsieur Hulot’s Holiday this is probably his least structured work in terms of a narrative. It’s also odd that this is the only one of his films where he doesn’t play the aforementioned Mr Hulot, instead playing a much more bumbling character in François the Postman. As a first feature, there are elements that prevent it from being discussed in the same pantheon as his other works. For one thing the pacing is affected by the transition from shorts to feature films, starting at a languorous pace before picking up in the final third. Added to that the François character, whilst demonstrating Tati’s comic timing, is less dimensional than the character that would make him most famous. Also, with his future films in mind, I think latter Tati would have really mined the comic and dramatic potential of all the events happening at the fair; as it stands it is mostly an excuse for François to see the (really funny) movie about the faster American postal service that really sets the plot in motion. But all that said, this is still a Tati film, and even in his debut has all the hallmarks of such. The envy of the motorised American postal service show that love/hate relationship with modernity that defines pretty much every one of his movies. And on top of that, it’s just funny. In fact the final sequence of François delivering all the letters “American Style” is maybe the most consistently funny stretch of film in the director’s whole discography, one that mines every joke you can think of about being a postman and hits as well in slapstick and stunt gags as any of the greats. Although said under the same breath as Chaplin and Keaton as one of the great slapstick clowns, more than any of them Tati really knew how to get jokes from sounds: the creaking flagposts, the movie dialogue playing in the background when the couple meet for the first time, and of course the music (Jean Yatove score is lovely and exuberant, and really helps to elevate some of the slower moments). Tati would only go on to improve from this movie, and would refine both his style and his writing as the years would go on (there is definitely more talking here than most of his other works). But as it stands, his filmmaking still hits a balance between humorous and an underlying melancholy that makes this film utterly delightful. This one certainly takes the cake. Addendum: I should probably add that I saw the 1949 B&W version that was the main addition on the Criterion release. Tati would go on to use colour in such a prominent way, but as it stands with the coloured additions put on the extras I don’t feel that anything is lost by watching this original cut.